Granted, the beginning (the first twenty minutes) is wonderful, and the ending pulls the drawstring nice and tight, but Act II, the middle-matter, is slacky and baggy and loose. It's by design, of course, to quell our minds and lull us into a false, idyllic sense of security but, to me, it lulled so deeply, so long, so quietly, that I found myself rather bored and the film wanting. For perhaps forty long minutes. That's a long stretch in a film that clocks in at a paltry 01:46:00. But wow, perhaps '18' tiny moments were so searing. Some quiet, honorable moments by Rylance, some completely silent moments with Hardy and his darting, knowing eyes, some telling looks from this young actor to that....really beautiful, sobering, often gracious and gallant. It's very English in that regard, never hammy or bombastic or over the top. Stiff upper lip, mate. And such patriotism by the citizenry. "Well done, men, well done" by a blind man. Beers from a stranger alongside a train. I love that stuff. The reading of Churchill's infamous words... "we shall not flag or fail. We shall go on to the end, we shall fight in France, we shall fight on the seas and oceans, we shall fight with growing confidence and growing strength in the air, we shall defend our Island, whatever the cost may be, we shall fight on the beaches, we shall fight on the landing grounds, we shall fight in the fields and in the streets, we shall fight in the hills; we shall never surrender, and even if, which I do not for a moment believe, this Island or a large part of it were subjugated and starving, then our Empire beyond the seas, armed and guarded by the British Fleet, would carry on the struggle, until, in God's good time, the New World, with all its power and might, steps forth to the rescue and the liberation of the old." You'll love those soaring bits, too, and simply wish there were a few more of them. Or, who knows, maybe you'll be in the majority of critics who hail it as the finest film in a half-century and count your blessings to have lived when it came out, knowing it said the most by saying the least. 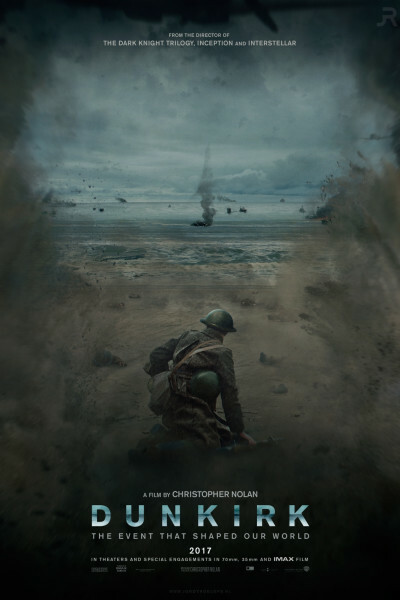 War is hell, of this we are certain—and often dehumanizing—but character studies illuminating survival are heavenly, and Dunkirk paints several rich ones, along with providing a pulsating metronomic score (Hans Zimmer) and tone that carries we fortunate few to the other side.